This is a time of much heart turmoil for everyone I know. It is easy to be overcome by fear when drowning in waves of change, Sweetheart. It is common to wonder where the Holy Spirit is when the world demands so much attention. Slowdown, HurtingHeart. Stop. Peaks and valleys are part of the challenges that grow us. Name your desire to know Father God better through your curveball of change. 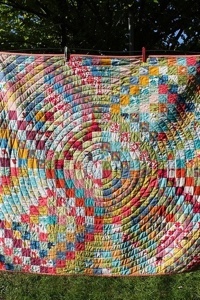 Allow the Spirit to shake out a creative quilt in you. Boldly follow the pattern of His Holy ways … His answers are personal, unique, tailor made to you alone. Trust the process, DearOne.